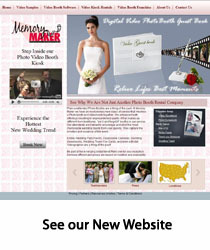 "I can't imagine my wedding without the Memory Maker Kiosk." The Memory Maker is a unique state of the art entertainment kiosk. Its sleek design and versatility makes it a hit at any party function. This is a must have event rental for your next party or wedding event. The machine records up to 2 min of video of a brides guests greeting onto a small video disc. It also prints out the customized photo sticker label that goes onto the video CD party favor. Copyright � 2008 Memory Maker All rights reserved.